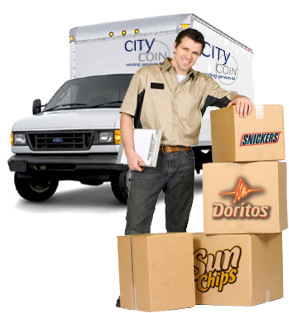 City Coin Vending Services Ltd. is an independent, Calgary-based organization. Locally owned and operated, City Coin employs a full-time staff of 30 people, dedicated exclusively to full-service vending operations. As a proud member of the Calgary business community for more than 36 years, City Coin has earned a reputation for exceeding customer expectations. With a clear focus on providing superior products and exceptional service, our company has grown to become one of Canada's largest vending service organizations. City Coin currently provides vending services to over four hundred locations, with an average business partnership spanning more than 10 years. City Coin is a long-standing member of our industry's national trade organization, the Canadian Automatic Merchandising Association. With our pledge to maintain the highest standards of professionalism and integrity as set out by this association, you can be assured that City Coin is committed to providing you with a vibrant and progressive vending program. TO BE ALBERTA'S VENDING COMPANY OF CHOICE; COMMITTED TO DELIVERING THE BEST TECHNOLOGY, PRODUCTS AND SERVICES TO EVERY ONE OF OUR CUSTOMERS. WE ARE A TEAM OF PEOPLE COMMITTED TO CONSISTENTLY EXCEEDING OUR CUSTOMER'S EXPECTATIONS. WE SUPPORT OUR CUSTOMERS BY DELIVERING SUPERIOR VENDING SERVICES WHEREVER THEY GATHER. If you would like more information on our products and services please do not hesitate to give us a call at (403) 253-0324 or email us at info@citycoin.ca and a City Coin representative will be happy to assist you.